Tomorrow’s the night! 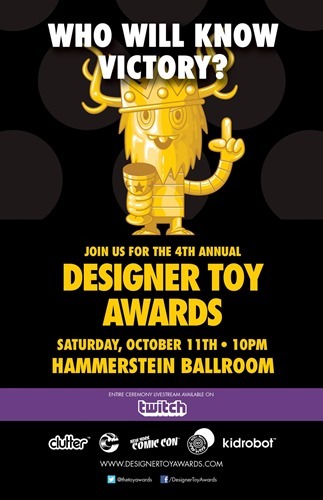 The Designer Toy Awards 2014 Ceremony will be held on Saturday (11.11) at the Hammerstein Ballroom in NYC at 10 PM. The DTAs have partnered with New York Comic-Con to elevate this year’s awards to new heights. This year’s celebration of the creativity of our industry will be hosted by TV personality/comic book writer Jesse Synder and streamed live on Twitch. Riding the bigger and better theme, admission to this year’s awards will be free to all who RSVP ahead of time. If you’d like to be able to avoid the line and support the DTAs at the same time, there are two levels of Fan VIP badges available. While each lets you skip the line, the $15 Fan VIP badge gets you a mystery bag worth at least 20 dollars and the $45 Fan VIP badge gets you a goodie bag containing merch worth 70 dollars or more. Clutter has tapped Jason Freeny to create a dissected version of Pete Fowler’s Toy Prince, which graces the Designer Toy Awards trophy. If you’ve always wanted your very own Toy Prince figure, here’s your chance. 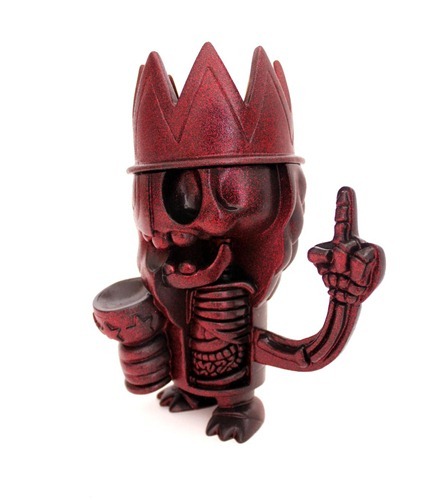 The 8” Dissected Toy Prince rotocast resin will debut in a Ruby Dust edition featuring glittering red + black hues. Limited to 30 pieces, it drops on Friday, July 11th 2014 @ Noon EDT for $125 from the Clutter Shop, which will go towards supporting the DTA 2014 ceremony during NYCC weekend in October. Clutter has kicked off the 2014 Designer Toy Awards season with the opening of nominations for all applicable categories. Nominations will be accepted through Tuesday, July 15th. In a notable change, nominees will not be listed on the DTA site. Category finalists, determined by the nomination committees, will be listed instead. There are several other changes including three new Fan Choice awards for Artist of the Year, Custom of the Year, and Toy of the Year. A few categories were dropped including Best Collection and Best 1/6th Scale. Finally, qualifications for a few categories have changed. In addition to having been active in 2013, Break-through Artist nominees must not have had a solo gallery exhibition before 2013 nor a production toy release financed by a 3rd party. Customizer of the Year has been changed to Custom of the Year, thus individual customs rather than artists will be nominated. Head on over to the DTA site to nominate your favorite toys, artists, stores, and blogs (! ).